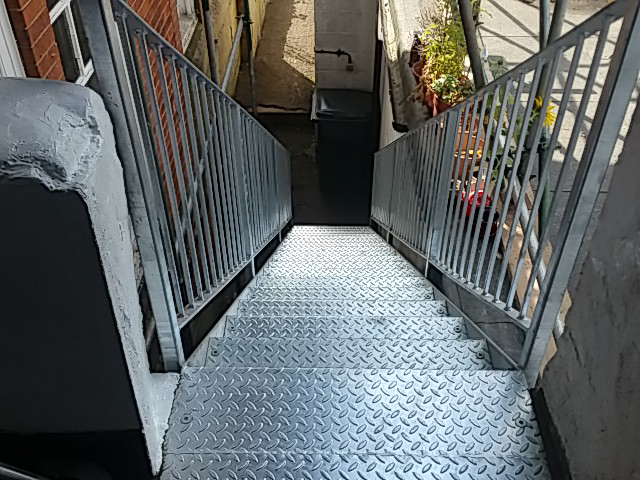 Down the rickety stairs and up a brand new set of steel fabricated ones! 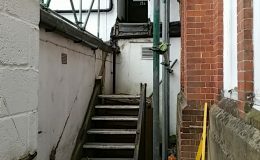 At Rapid Response we always talk about the diversity of our work. 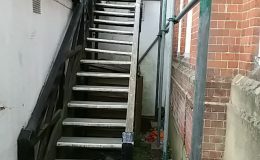 Of course the majority of what we do is probably classed as standard, i.e., plumbing, electrical, boiler servicing, roofing, flooring, decorating and a great deal of emergency work. 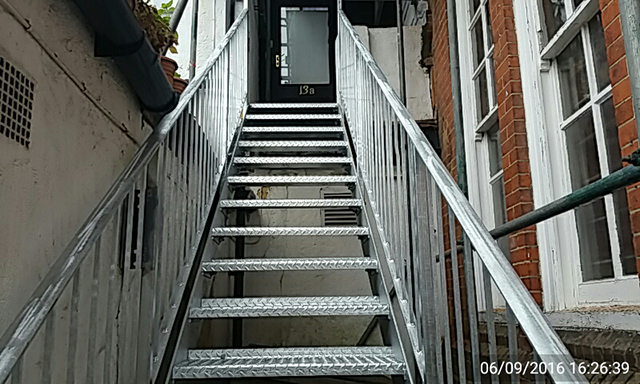 However, we are asked to undertake some more unusual projects too, and the steel fabricated stairs we have designed, built and installed for this project is very typical of one of our unusual requests. 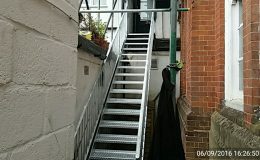 With space at a premium this project was particularly difficult. 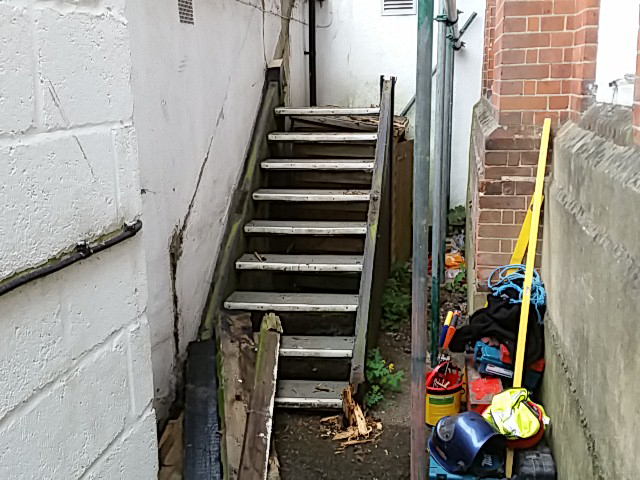 First, we had to take down the original oak staircase which was a little rickety and dangerous to say the least, perfectly demonstrated in the photographs we took at the time. 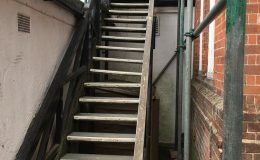 External staircases made from oak or timber were extremely common place back in the mid to late 20th century, when many properties were converted from single occupancy family houses to flats. 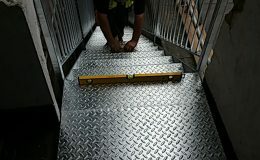 These were pretty much a standardised off the peg item for the multitude of flat conversions at the time. 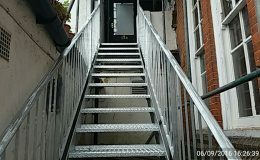 These allowed first floor occupants an escape route in case of a fire, and more commonly used to access the outside areas of the property. 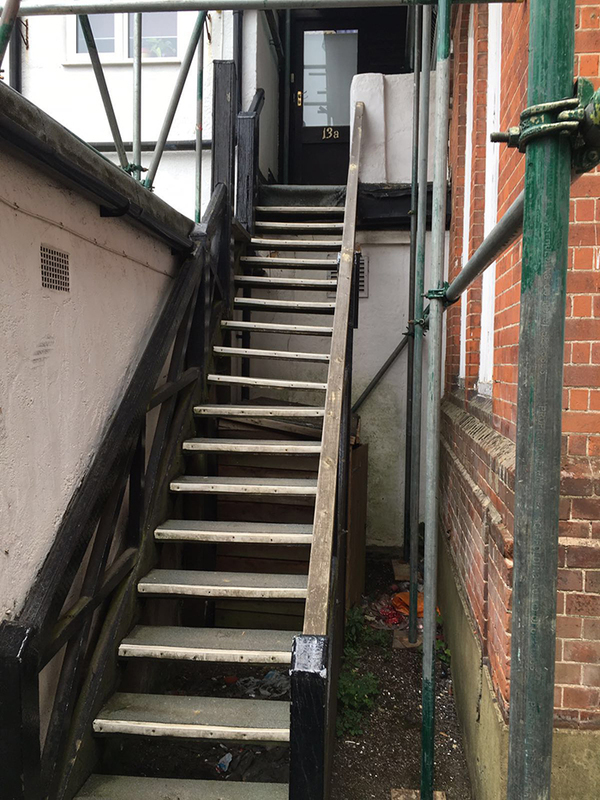 It is still not unusual to see the odd external timber staircase in use, but most now have been replaced by safer and more robust fabricated steel versions. 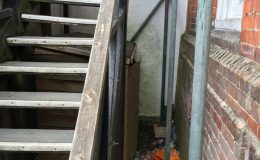 The confined space on this project did represent a challenge in regards to health and safety, and the careful dismantling of the solid timber staircase. 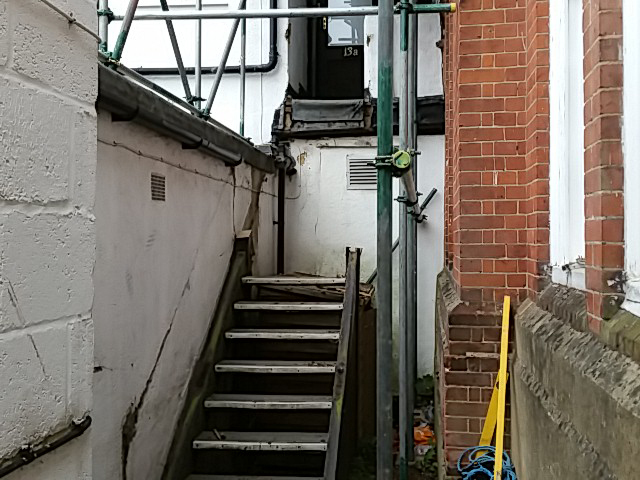 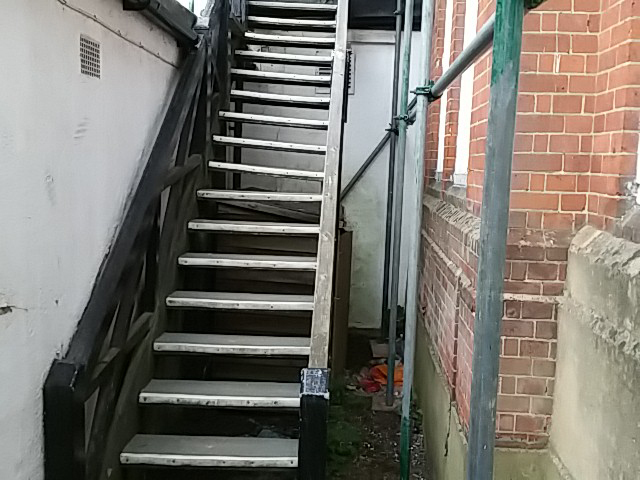 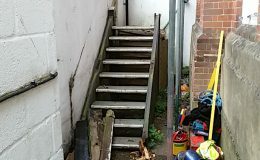 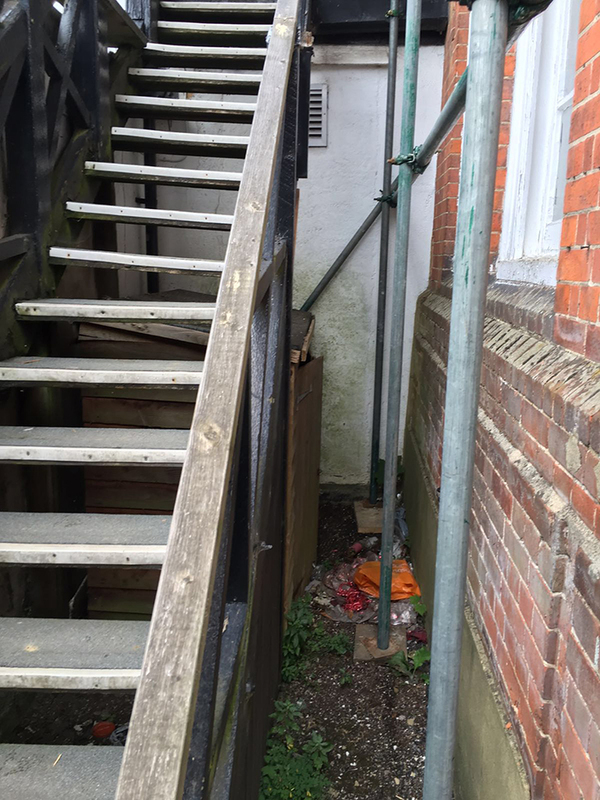 We were able to dismantle from top down using a safe scaffold construction to give us proper access across the adjacent roof, and to all parts of the staircase, further enabling safe removal of all of the timber. 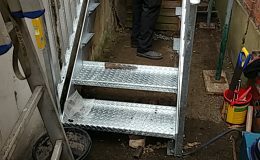 While demolition of the staircase was in progress, our engineers designed a new fabricated construction for a replacement staircase. 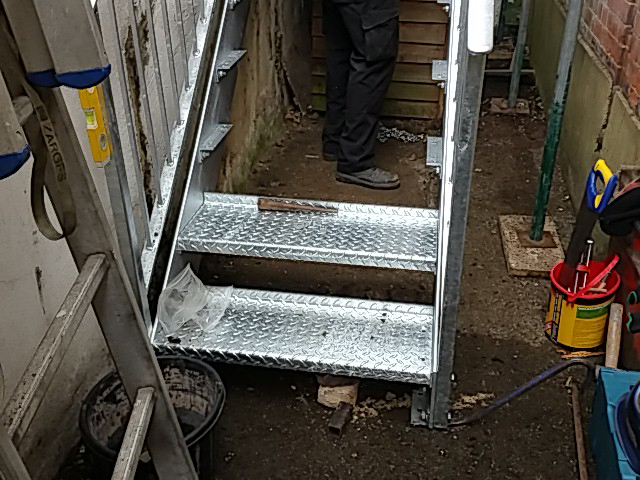 The straight forward solid design allowed for a very quick and easy build albeit we were still hampered slightly by the confined working area. 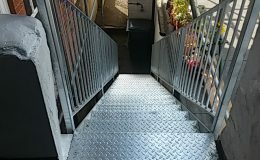 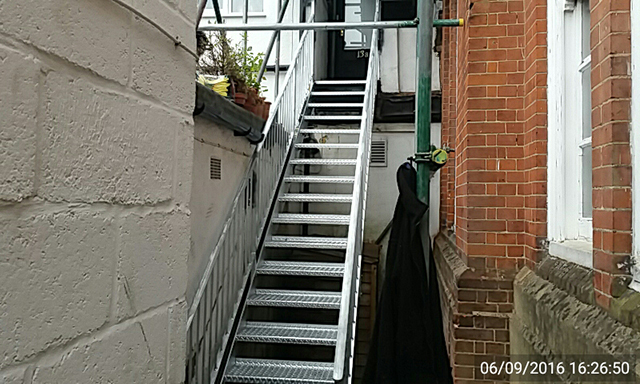 This created a safe and robust replacement for the occupants, utilising non-slip sheeting for the stairs themselves, with the anodised finish providing longevity and a base ready for painting. 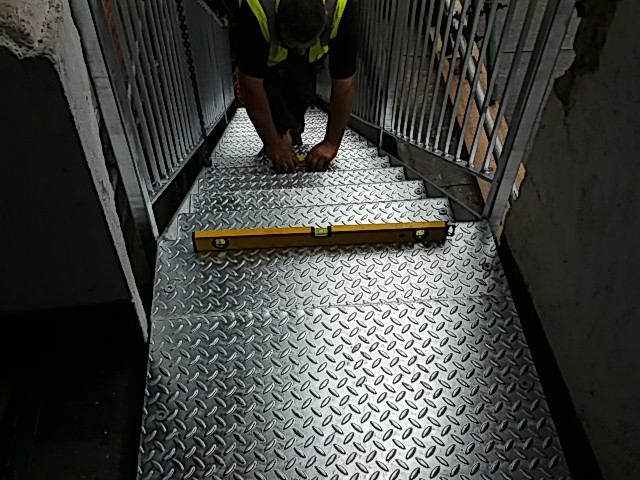 With our multitude of skills and services, it is very common for us to be categorised by industry and clients it a specific trade sector, but in reality our team of tradesman and engineers can resolve the most unusual of project requests, and we always like to demonstrate the versatility of the team at Rapid Response!